Aadhaar Attendance Machine Android Based Attendance System Suitable for Aadhar. We have Aadhar attendance machines which can be linked with Aadhaar attendance server. Aadhaar Enabled Android Attendance System. AEBAS stands for Aadhaar Enabled Biometric Attendance System. The purpose AEBAS system is to enable an employee with an Aadhaar Number, to mark his/her attendance in the government offices through Biometric Authentication device. We have 4 options available for Aadhaar attendance machine. We have a complete online solution meant for leveraging the ready Android infrastructure. It is a Finger Print Biometric reader connected to an Android based 7’’ Tablet, housed in a wall mount enclosure. The machine is configured to connect to a server on the internet using Wifi or GPRS. It is having a rooted Mobile App loaded for online operation. We are wholesalers and traders of Biometric Attendance Machine, Aadhar Enable Bio-metric Attendance Systems (AEBAS) for PMKVY 2.0. – Complete Match With All AEBAS Norms. – Online With PMKVY Portal. – 1GB RAM – 4/8 GB Memory. – 7 Inch Touch Screen. Call us now at 9315441053, 9315441078 WhatsApp 9315441053 or email us at info@ampletrails.com for more information on Aadhaar enabled biometric attendance system price. AADHAAR Enabled Biometric Attendance System (AEBAS) is an attendance management system designed for the government organizations by Government of India to improve the productivity of employees. The system authenticates attendance using AADHAAR number created by Unique Identification Authority of India (UIDAI). Matrix introduces the first embedded Linux based AADHAAR enabled biometric attendance device registered on AEBAS Server – COSEC VEGA FAXQ. It authenticates the user using their AADHAAR number stored in the smart card and fingerprint in less than 1.5 sec. This integrated device offers unique benefits in terms of reliability, convenience, speed and data security. AADHAAR Enabled Biometric Attendance System (AEBAS) is an attendance management system designed for government organizations by Government of India to improve the productivity of employees. The system authenticates attendance using AADHAAR number created by Unique Identification Authority of India (UIDAI). It is a cloud-based BAS (Biometric Attendance System) that monitors attendance of government employees in real-time. If you want most reliable Aadhaar Enabled Biometric Attendance Device then do contact us. 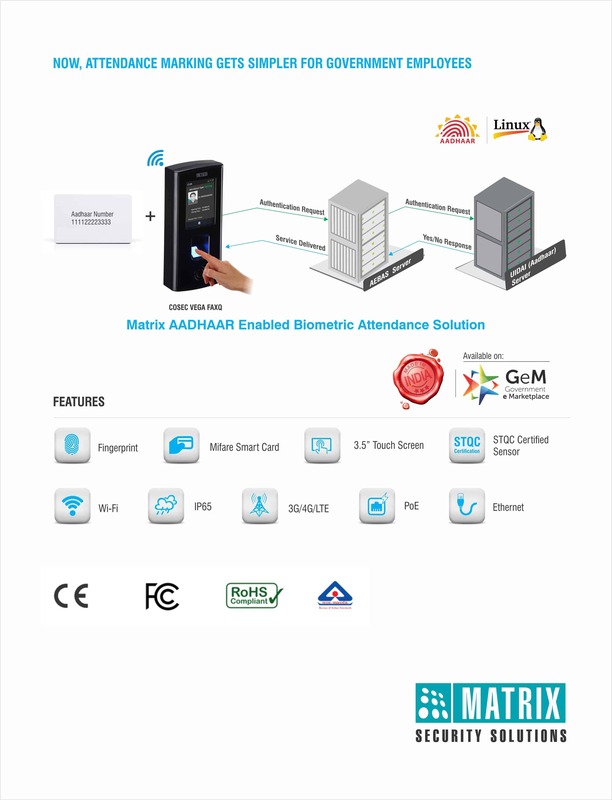 Matrix Aadhaar Enabled Biometric Attendance Device is designed and manufactured in India and is only meant for Indian requirements. Aadhaar Enabled Biometric Attendance Device is designed looking for your long-term money saving. It’s the most reliable Aadhaar Enabled Biometric Attendance Device. First embedded Linux based AADHAAR enabled biometric attendance device registered on AEBAS Server – COSEC VEGA FAXQ. 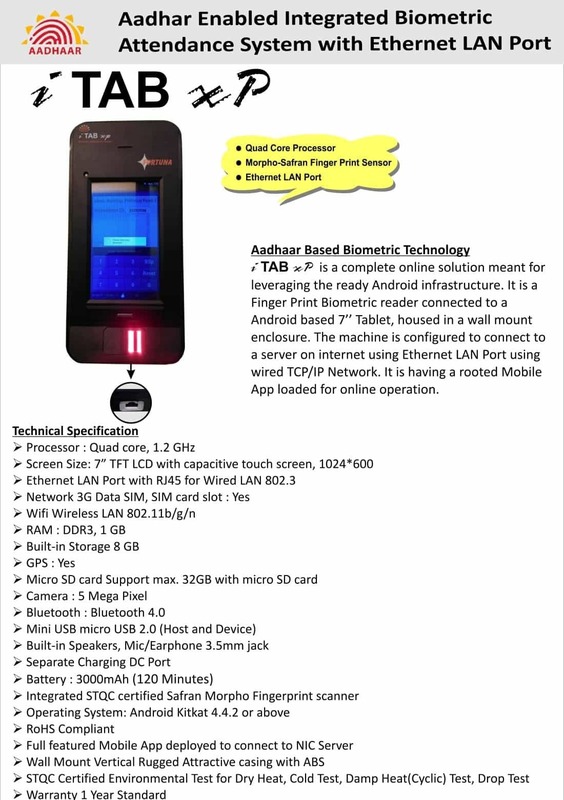 This AADHAAR biometric device is purposely designed for attendance marking application. It authenticates users using their AADHAAR number stored in the smart card and fingerprint in less than 1.5 sec. The device offers unique advantages in terms of connectivity, technology, usage environment, and easiness. Its IP65 design, smart card, multi-language, PoE, wireless connectivity, and touchscreen make it a foolproof Time-Attendance solution for Government organizations. 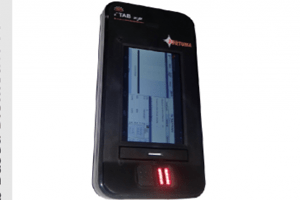 It is an AADHAAR enabled biometric attendance device that captures the attendance data and sends it to the AEBAS server in real-time. Designed for Attendance Management on a Linux Platform for Long-Term Consistent Performance. multi-language, PoE, wireless connectivity and touchscreen makes it a foolproof Time-Attendance solution for Government organizations. 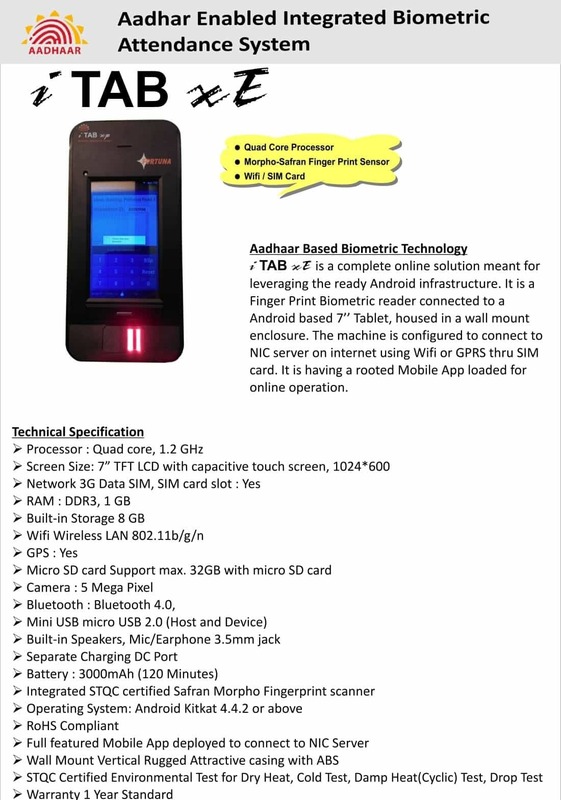 Matrix AADHAAR Enabled Biometric Attendance Device (COSEC VEGA FAXQ) has competitive advantages over its competitors- Android-based tablet devices. Due to continuous technology upgrades, product specifications are subject to change without notice. Fill the following form to get in touch with one of our experts in providing solution for Aadhaar Attendance Machine. Central and state governments are embracing Aadhaar Enabled Biometric Attendance System (AEBAS) rapidly throughout the country, opening unprecedented opportunities for Matrix and Partners. 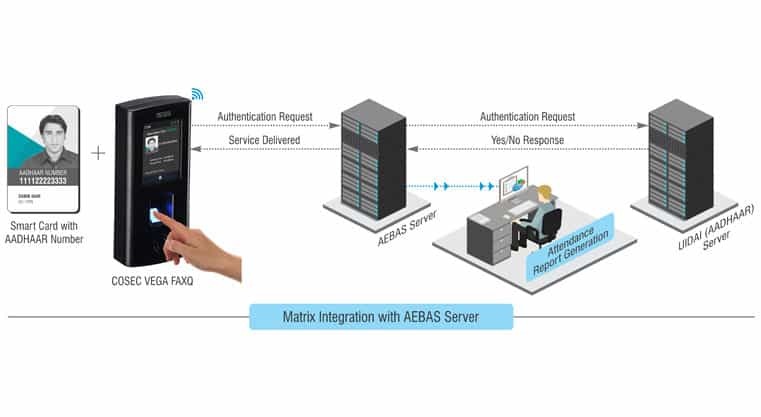 Matrix AEBAS products are simple, robust, and popular with Government Organizations. Further, Matrix has built a team of experts on GeM and tender processes to help SI in winning Government orders with minimal effort and time. Collaboration between Matrix and SI. 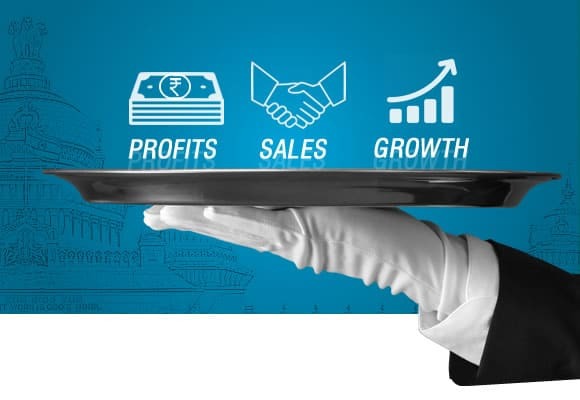 SI to recruit field sales people dedicated for government sales. Matrix would train these sales people on Matrix products and GeM. SI government sales team would visit government offices. Matrix would lock every case generated by the SI. Matrix would help SI with presentations, BOQ, demo and POC. Matrix would help customers with GeM procurement process. Matrix would help the SI in order execution, installation and support. Many SIs have already hired sales engineers to grow their government business. If you, too, want to collaborate with Matrix, contact us for more details. We are one of the largest suppliers of Aadhaar based Biometric Attendance Machines. We are supplying Aadhaar based Biometric Attendance System allover India. Aadhaar Enabled Biometric Attendance System is used to mark attendance using the Aadhaar Card number linked with Aadhaar server. Aadhaar based attendance machines can be used for students attendance. We are one of the largest Aadhaar Biometric Machine Suppliers in India. We have presence all over India. Get the best quality product at the lowest price. MANTRA MFSTAB Terminal is all-in-one, affordable, WiFi enabled terminal. It can be used for various applicationssuch as Time Attendance, Access Control, Workflow Management, Canteen Management, VisitorManagement, Worker Management etc. This innovative Biometric clock will ramatically improve your abilityto monitor your workforce movements during their working patterns and with features that gives you bettertime and management reporting. MANTRA MFSTAB is suitable for both basic to moderately complex time and attendance requirements. The 7″Touch screen offers a wide range of possibilities, starting from the classical Time recording App to a complexFactory Data Collection App or a high-security solution with ccess queries supported by a comparison of liveimages with stored images or audio-visual communication to a Service Command Centre, e.g. for Datacentres. Everything is possible. Compatible with state of the art TimeTrak, BioPay software. Refer us and get Rs. 1000 PayTM cash in your account. Get special price with Free delivery of Aadhaar based Biometric Attendance System across India. 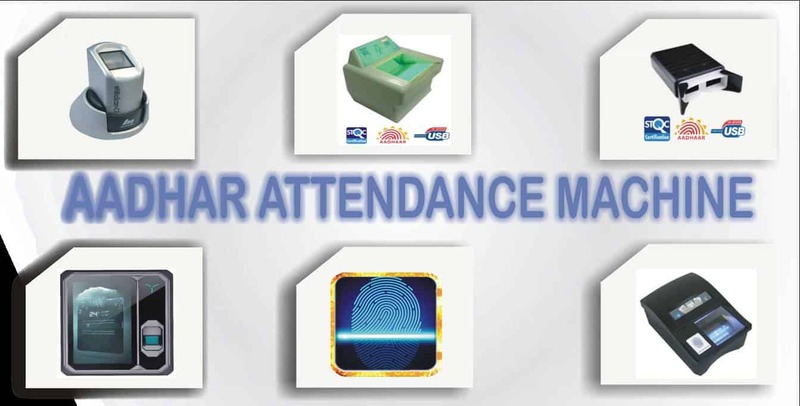 Options for Biometric Attendance Machines that can be used to mark attendance. Track entry time exit time monthly attendance. Real-time data can be accessed all over World. We have the best time attendance system with AADHAAR Link. Our device is DGSnD certified. 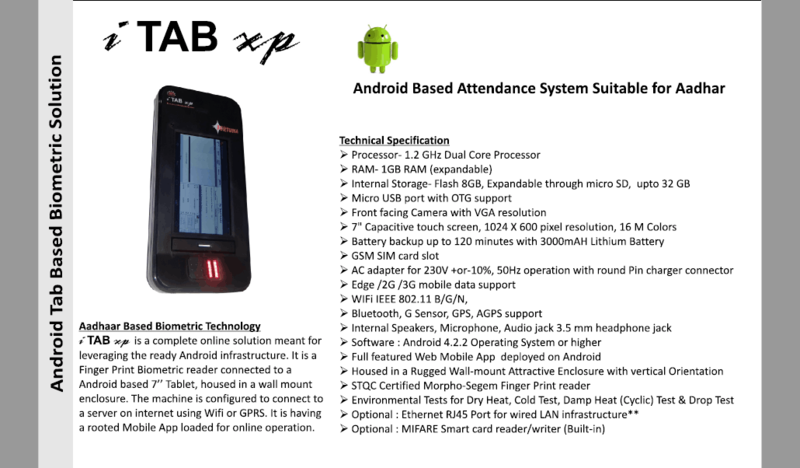 We have 2 models of Android based Attendance System Suitable for Aadhaar. 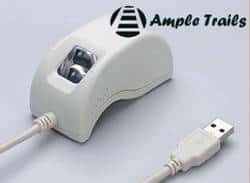 For more information contact us at 09818390836, 09315441078 9315441053 or email us at info@ampletrails.com. 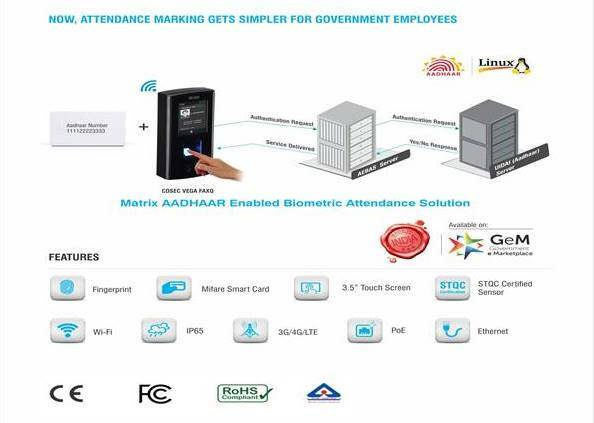 Aadhaar enabled biometric attendance system suppliers. You can contact us to know Aadhaar Enabled Biometric Attendance system price in Delhi. We are the top Aadhaar enabled Biometric Attendance System vendors in India. Our Biometric aadhaar enabled biometric attendance system specifications matches exactly with that of the one provided by the PMKVY. AmpleTrails offers Aadhaar Enabled Biometric Attendance System in India. 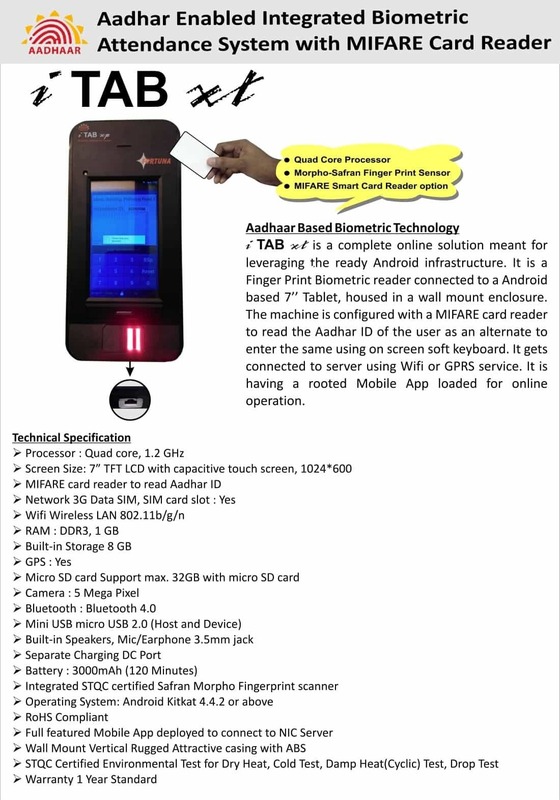 Aadhaar Enabled Biometric Attendance System (AEBAS), Fingerprint biometric Based real time attendance system. Get the fingerprint sensor which can be used for Reliance Jio Fingerprint eKYC activation Morpho MSO 1300. 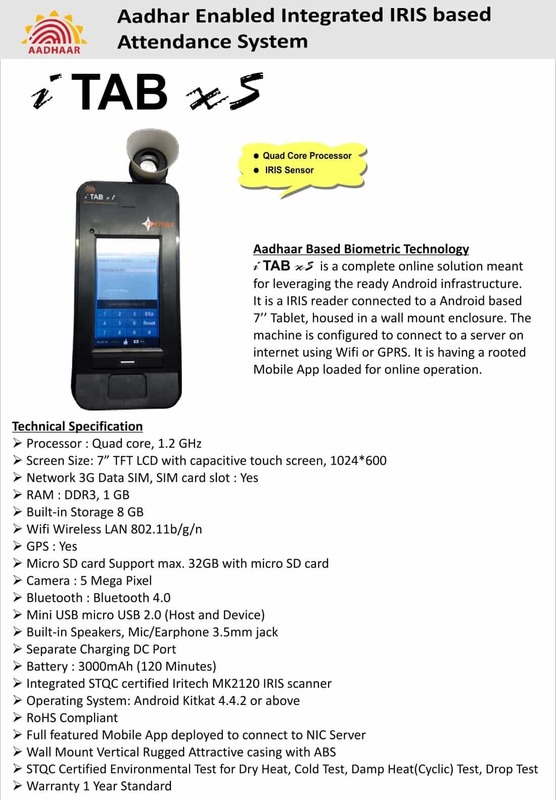 Aadhaar enabled handheld terminal with STQC Certified Fingerprint scanner. 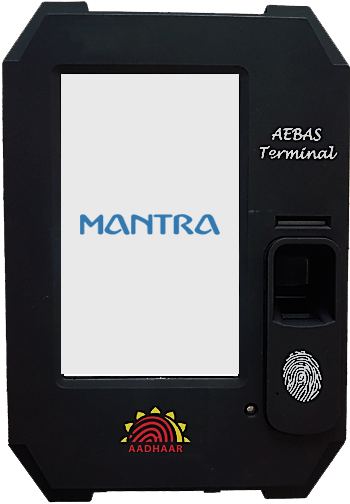 Aadhaar Enabled Biometric Attendance System (AEBAS). 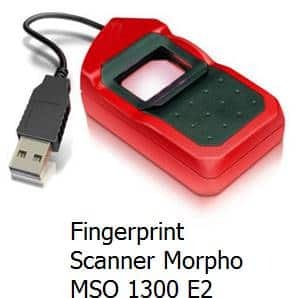 Fingerprint Scanners For Govt. Schemes & Egov in India. Get best price for Aadhaar Enabled Biometric Attendance System (AEBAS). These Biometric Devices can’t be used for Biometric Access Controls. These devices are specially designed for Aadhaar Enabled Biometric Attendance System (AEBAS). Aadhaar enabled biometric attendance system for PMKVY Centers. In Durgapur ,West Bengal, we have biometric time and attendance in Iron & Steel, Power, Cement, Chemicals, Heavy engineering etc. In Pithampur ,Madhya Pradesh, we have fingerprint attendance machine in auto cluster, medicine,cotton yarn, auto testing treck etc. The MFSTAB Terminal is all-in-one, affordable, WiFi enabled terminal. It can be used for various applications such as Time Attendance, Access Control, Workflow Management, Canteen Management, Visitor Management, Worker Management etc. This innovative Biometric the clock will dramatically improve your ability to monitor your workforce movements during their working patterns and with features that gives you better time and management reporting. The MFSTAB Terminal is all-in-one, affordable, WiFi enabled terminal. It can be used for various applications such as Time Attendance, Access Control, Workflow Management, Canteen Management, Visitor Management, Worker Management etc. This innovative Biometric clock will dramatically improve your ability to monitor your workforce movements during their working patterns and with features that give you better time and management reporting. The MFSTAB is suitable for both basic to moderately complex time and attendance requirements. The 7″ Touchscreen offers a wide range of possibilities, starting from the classical Time recording App to a complex Factory Data Collection App or a the high-security solution with access queries supported by a comparison of live images with stored images or audio-visual communication to a Service Command Centre, e.g. for Datacenters. Everything is possible.